Anybody even vaguely related to aviation is aware of the importance of Gander as a refueling site for airplanes crossing the Atlantic, especially in the 1940s and 50s. It is easy to visualize DC6s, DC7s, Constellations, Stratocruisers and the like on the ramp, as faithful employees from Shell and Esso gassed them up in rain, snow or hail. However, very few people are aware of what happened in Gander as far as "in-flight" refueling is concerned. Little is known of those tanker airplanes that took off from Gander to refuel another airplanes in mid-air. Some years ago I bought a postcard showing what looked like a Lancaster bomber in Gander that looked strange and had a civilian registration number to boot. I reckoned it was probably just some airplane passing through. On looking at it more closely, I saw the name "Flight Refuelling" and decided to follow the trail. But before going any further, I must firstly say thanks to a great group of people. The international company Cobham plc, based in England, is now the parent company of Flight Refuelling Ltd (FRL) who owned the airplane on the postcard. Cobham is engaged in the development, delivery and support of aerospace and defense technology and systems. A first thank-you goes to Philip Smart, Brand and Digital media Manager, who so very kindly piloted all my requests for info. Colin Cruddas, archivist with the Cobham archives, was helpful to the point of even giving me access to sections of a then unpublished book on in-flight refueling by Brian Gardner. Their information and that from many other sources tells the story - and quite a story it is! The vast majority of airplanes developped between the two world wars were capable of flying only short distances. Many different techniques were used to enable planes to fly farther, including low-drag steel monocoque skins instead of wood or fabric, sleeker design, larger fuel tanks (which could sometimes be jettisoned) and more efficient engines. It should be noted however that gradually, the real objective was no longer to increase distance but rather the payload. Imperial Airways flying boats were already able to fly a transatlantic service via Ireland and Botwood, Newfoundland, but only with a heavy fuel load and therefore very much smaller payloads. While work went on to modify individual aircraft, another possibility envisaged was the "piggy-back" or "composite" solution, using two airplanes. The Short-Mayo composite project in Great Britain combined an S.20 seaplane, called Mercury, and a larger S.23 C flying boat, named Maia, which had been modified to accommodate Mercury atop its fuselage. On 21 July 1938, the composite took off from Foynes, Ireland, with the Maia flown by Capt Wilcockson and Mercury by Capt D C T Bennett (two well known names in Gander's history). It was a successful twenty-hour twenty-minute non-stop flight to Montreal with half a ton of mail, newspapers and newsreels. The composite was used successfully for cargo, but was considered too dangerous for carrying passengers. In the meantime, mid-air refueling was being looked at as a possible solution - and it had humble beginnings! The first real attempts were in 1921 when a U.S. Huff-Daland HD-4 used a grappling hook to snag a 5-gallon gas can from a float. In another case, a wing walker, with a gas can strapped to his back, climbed from one airplane to another to pour gas into the aircraft’s tank. 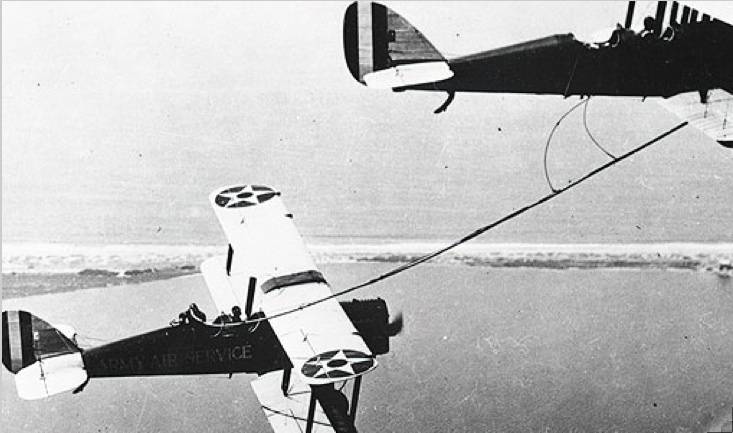 Gravity-fed refueling came along in 1923 when military pilots in San Diego used one bi-plane, a Havilland DH-4B, to refuel a second using a 50-foot hose made of rubber - somehow not getting the hose caught up in the prop or dousing themselves with aviation gas! In the US, the best known testing was done with the airplane "Question Mark", a tri-engine Fokker C-2. The flight lasted from 01 to 07 January, 1929; a total of 150 hours and 40 minutes, including a flight over the New Year’s Day Rose Bowl football game. During the flight, they made 43 contacts with the tanker aircraft, each contact lasted about 7 1/2 minutes, with the aircraft about 15 to 20 feet apart. The two refueling aircraft alternating in the operation were Douglas C-1 single-engine bi-planes with a refueling hose passed through a hatch cut in the floor. During the refueling contacts, the tanker crews also passed oil, food, water and other miscellaneous items, by means of a rope. In-flight refueling research continued as well in other countries, particularly Great Britain. In the early 1930s, Lt. Richard Atcherley of Britain’s Royal Air Force devised a new approach wherein the tanker trailed 300 feet of line with a grapnel hook at the end, which then hooked a 100 ft weighted line dangling from the receiving aircraft. Atcherley’s “crossover” method, patented in 1935, was purchased by Flight Refueling Limited, headed by Alan Cobham, who had been knighted for his work on civil aviation. The company received support from Imperial Airways and in the late 1930s developed what came to be called "the looped-hose" method. Here the receiving airplane pulled a weighted line with a grapnel hook at the end. The tanker flew alongside and literally fired its own hooked line across the other to entangle the hooks. The line was first drawn back into the tanker where the receiver's cable was then connected to the refueling hose. The receiver then hauled back in its own cable bringing the hose with it. Once the hose was connected, the tanker climbed sufficiently above the receiver aircraft to allow the fuel to flow under gravity. In February/March 1939, these bombers were given British Civil Registrations as G-AFRL, G-AFRG and G-AFRH. They were equipped with the extra internal fuel tanks of 1000 Imperial gallons, impressive for the time. The tanker G-AFRL was based at Rineanna (Shannon), Ireland and the two other Harrows were shipped as deck cargo to Montreal on the steamer SS Bedford which was part of the Canadian Pacific Shipping Line. They were then uncrated and reassembled in Longueuil, the Fairchilds Aircraft base, and were then flown to “Newfoundland Airport”. Spare parts were also sent to Gander, so the aircraft and team were fairly self-sufficient, though for a part of the time a railway boxcar was used as accommodations. After considerable testing, the first real success came on August 5, 1939 when a weekly mail service was inaugurated. Even the prime Minister of Ireland, M Éamon de Valera, was present for the departure. Two Imperial Airways Short S-30 flying boats flew on the Southampton-Foynes-Botwood-Montreal-New York route, refueling in the air twice, once over Ireland and once over Newfoundland. Refueling took place shortly after takeoff. On their return flights the flying boats were refueled by G-AFRG and G-AFRH, after take-off from Botwood. It took generally less than 15 minutes, depending on weather conditions, to transfer the fuel between the two aircraft flying on average at about 125 mph. An absolutely splendid video of a Flying Boat being refueled by a Handley Page Harrows can be seen here, a beautiful thing to watch ! But before this advance could change commercial travel, the Second World put an end to trans-Atlantic commercial flying. The three Harrow tankers did not stay around for long. 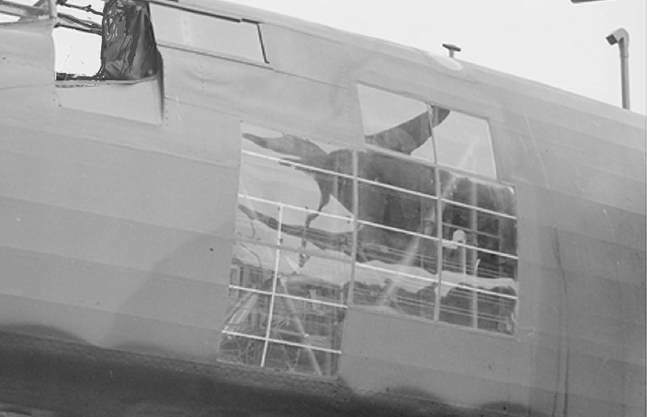 The tanker based in Ireland G-AFRL was returned to Ford Aerodrome, Littlehampton, Sussex, UK, where it was destroyed by a Luftwaffe bomber attack on August 18, 1940, along with other aircraft of the Flight Refuelling fleet. 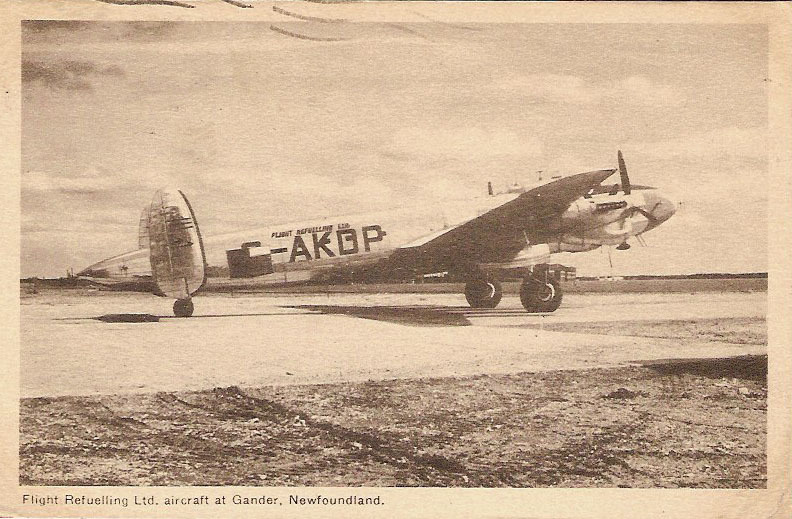 The two tankers in Newfoundland were kept in Gander for a number of tasks but mainly to be used in runway snow-clearing experiments and landing trials on compacted snow. The RCAF took them over operationally at the end of 1939, with an official transfer date of 21 October 1940. They then were used by the RCAF Test and Development facility in Rockcliffe near Ottawa. 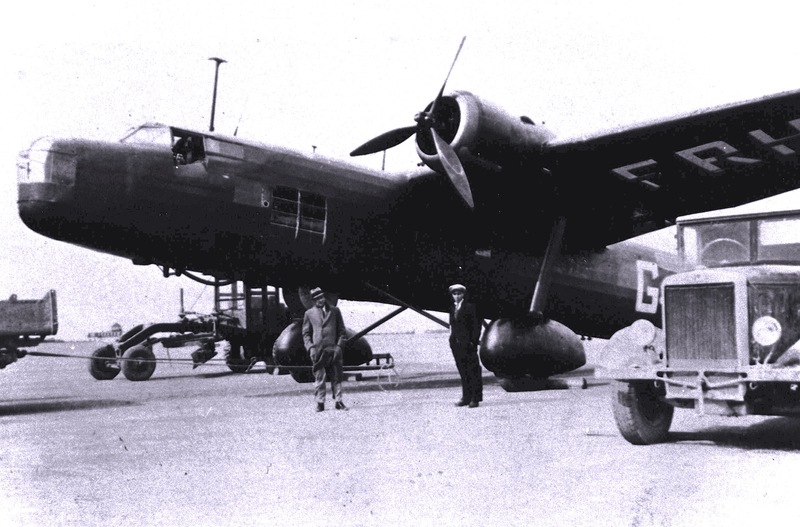 The tanker G-AFRH was grounded for lack of spare parts on 22 January 1941 and was used to keep G-AFRG flying. However G-AFRG was also scrapped on 17 November of the same year. Sir Cobham was sure that mid-air refueling services would again be required as commercial flying recommenced after the end of World War ll. He therefore decided to use these these same Lancasters in another way. In April 1946 the British Ministry of Supply had four former RAF Lancaster B.Mk.IIIs registered as G-AHJT to G-AHJW, and supplied them to Flight Refuelling Ltd, at the Ford Aerodrome in the UK. They were converted into two pairs of tanker/receiver and were used to perfect the company's refueling techniques. FRL itself operated the tankers while a civilian airline flew the receivers, with a frequent rotation of pilots so as to give practice to as many as possible. The main trials were conducted over the south of England in the winter of 1946-47 and simulated mid-ocean refueling. Rather than being like the "Visual Flight Rules" operations that were conducted pre-war, these were all-weather, day-and-night operations, and involved distant interceptions that called upon radar and modern radio communications such as transponders. Each Lancaster tanker could deliver approximately 2,800 U.S. gallons and by now was using a FRL design breakthrough which consisted of the probe/drogue method. The tanker merely trails a hose with a stabilizing drogue on the end. This also serves as a conical guide for a rigid forward-pointing pipe or probe of the receiver aircraft. Put more simply, it looks like a hose with a funnel on the end that a probe of the receiving airplane slips into. This method is universally used today. Two Lancastrian tankers were based at Shannon with one at Goose Bay and the other at Gander. 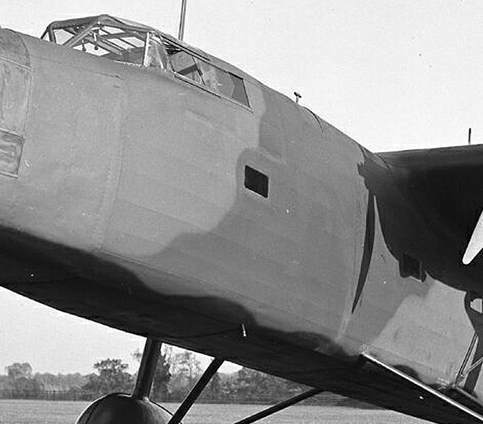 For the trials, the receiver was a B–24 Liberator that BOAC had converted to cargo. Because of help from the prevailing winds, for an eastbound flight, only one mid-air refueling was necessary, generally when the Liberator had passed 200 or so miles east of Gander or Goose Bay as the case may be. Two refuelings, one at each end, were required for the westbound trip. Between February 4 and May 30, 1948, fifteen flights each way were served by mid-air refueling, permitting the Liberator to fly nonstop - 3,240 miles - from London to Dorval. - staying as close as possible the "Great Circle Route"
- and more importantly, the possibility for the receiving aircraft to get to an emergency airport if the refueling aborted. A couple of interesting points - firstly it is rather paradoxical that Cobham used converted military aircraft to refuel civilian aircraft. Today no civilian airplanes use in-flight refueling but the military use it constantly. It is also noteworthy that the pioneers of mid-air refueling went on to great things in their careers. For those who are familiar with military history, the names of several of the US officers involved in the "Question Mark" operation - such as Major Carl Spaatz, Lieutenant Elwood Quesada and Capt. Hugh Elmendorf - are very well known. Spaatz became Commanding General of the US Army Air Forces in February 1946. Quesada commanded the US tactical air forces at the end of the war; he also was the first administrator of the Federal Aviation Administration and became the owner of a baseball team. In the case of Elmendorf, he did not reach a high rank due to an early death but has an air force base named after him in Alaska. On the British side, in 1943 DCT Bennett became, at 33, the youngest officer promoted to Air Vice Marshal. I end on a personal note. Some time ago I spoke with my father, Calvin J Pelley, who worked for Shell, about these post-war refuelling trials. He remembers vividly climbing on the wings of both the passenger and tanker Lancastrians, especially in the cold winter, to refuel them and make sure they were ready to go. Sort of makes the whole thing real!